“Proxima B: Our First Step Beyond” is a fascinating 23-minute documentary by Parallaxity presents the only recently known possibility that we have a habitable planet, somewhat larger than Earth, circling Proxima B, the closest star. 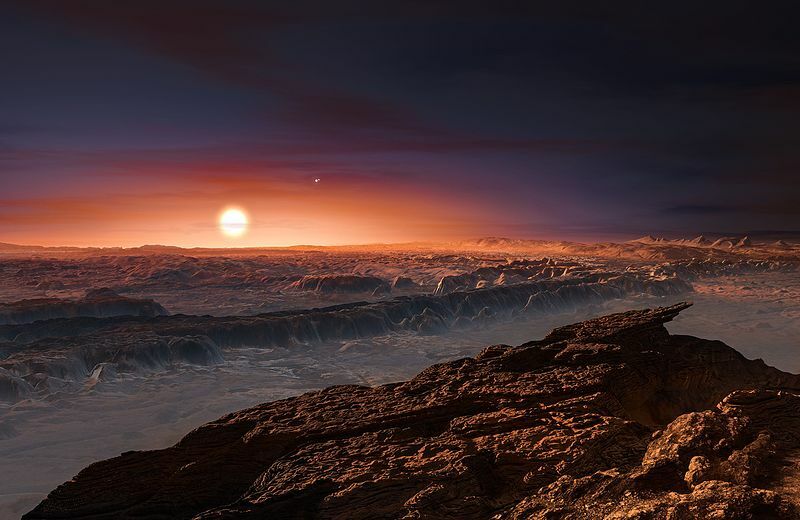 Proxima B is a red dwarf, connected distantly in a multiple system with Alpha Centauri, a binary system of 2 sun-like stars, but right now Proxima B is slightly closer (at 4.2 light years). Any planet is likely to be tidally locked. If in an elliptical orbit, it could have night and days each about 11 “days” long or it may have one side always facing its sub if in circular orbit, with a habitable “twilight zone”. It would need a strong magnetic field to resist the red dwarf’s coronal mass ejections, but it is possible that convection in its core could give the planet such. The greatest danger might be runaway greenhouse effect if there were too much carbon dioxide or hydrocarbons. Plants would probably absorb all light and look black. There is a Russia businessman, comparable in wealth to Elon Mush, who claims he can fund a light sail spaceship to reach the planet in 20 years. Much more about the planet should be known from a new European telescope in about five years. But the video gives hope that the planet could be habitable. Since the Sun will become unstable in 600 million years and kick us out, a planet around a small M Star would be stable for hundreds of billions. In his film series Prometheus, directly Ridley Scott has suggested that aliens could colonize M-star planets as a stepping stone to galactic conquest. The film shows a “rama” colony as an intermediate step. If a “Clark Kent” as in the Smallville series really exists, could he come from Proxima B (as Krypton)? Would he have the full legal rights of a human? Picture: hypothetical highway and city in a “micronation” on this new world. Second picture: ESO, CCSA 4.0, link.